It is summer. You knew that for any number of reasons. For example, you get your fresh vegetables from your garden or the local farm stand. The county fair season is in full bloom. Oh yeah, and if you have school age kids they are home unless they are at a camp. There are vacations and family reunions. Summer is the time of year you try to squeeze in more than is possible right? This week included a Vet Wellness. The front office gals said they were so happy that we brought them puppy therapy. 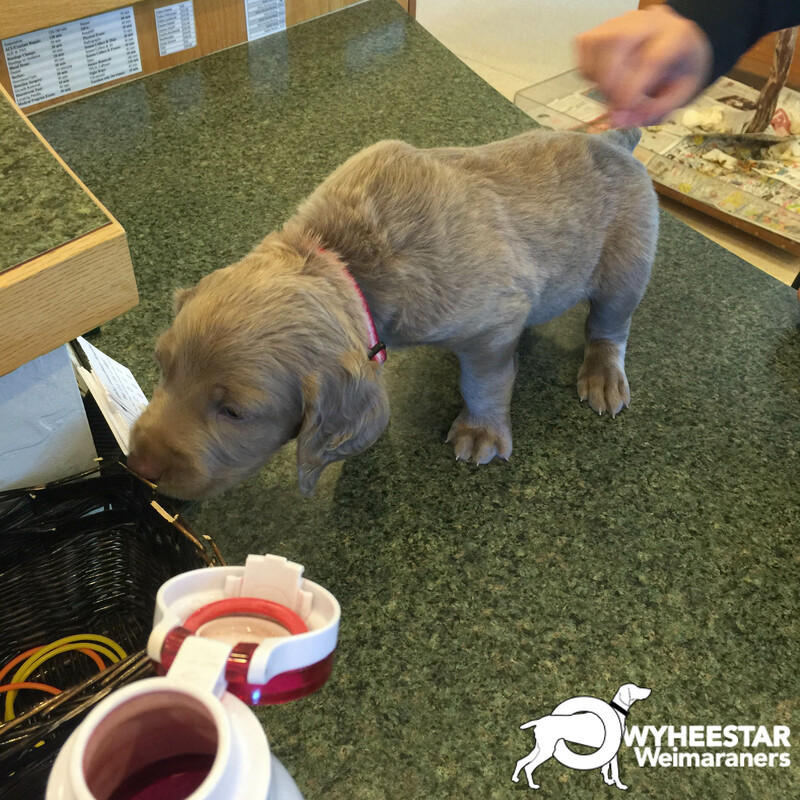 They are very nice; they take excellent care of us and the OwyheeStar Weimaraners. Of course, Dr. Calhoun has beyond good to us. You might have seen the comment on Facebook by one of our local clients saying how great he has been with her and their fur family members. 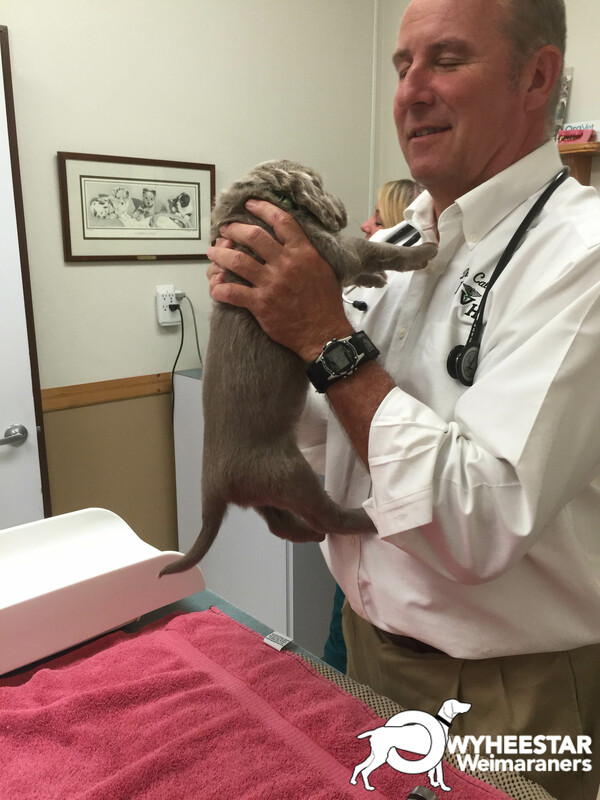 We cannot thank Idaho Veterinary Hospital enough for all they do for us and our clients. We recommend them without hesitation. These OwyheeStar puppies said to say they endorse these gals. They were hoping that they might be their new mommy; however, they will soon be welcomed and loved (equally adored) by their forever family. The hugs and attention lavished on them was extraordinary. They can expect much the same from those awaiting their arrival. The gals asked Dr. Calhoun to get them one of our pups for a Christmas present. I guess the adoration was more than a mutual fling. Puppy loves make the day go better–so we are sending you that and some puppy breath. We are once again thankful for the updates that make this possible! We are running a bit thin on the material we for the coming week. So, thank you in advance for saving our bacon so to speak. Wednesday, July 29— Did you Know? It has been a good week. It has been a difficult week. Sometimes our good and challenging events overlap. A person must look at the latter and keep a proper perspective. If you do not, then it can overtake your heart with a negative snare. That would not be a healthy way to live. Therefore, we got quite a bit accomplished on a personal level with our remodel, and as well with the Weimaraners. The downside came on Friday when despite Shela’s diligence to maintain her arm, it flared up in short order. Now, she has to have an ultrasound. We will wait and see what the findings divulge and how they affect the continued aftercare. The limitations are tough. Before the Lymphedema, it was often overwhelming to try to keep up with all that OwyheeStar (and the personal life) requires. Shela’s inability to do everything she would do for folks and everything asked of her is hard to manage. All too often people have to wait. Nonetheless, the puppies always get the care needed. They come first. Most people understand. If they cannot, then they will have to go elsewhere. Cliff and Shela are thankful for all the faithful and patient folks that work with them. Thank you for your love and support. Keep the puppy updates coming–as I said above, I am running low on material. I need them for inspiration, and they brighten our day. Yes, and allow us to have something to share. 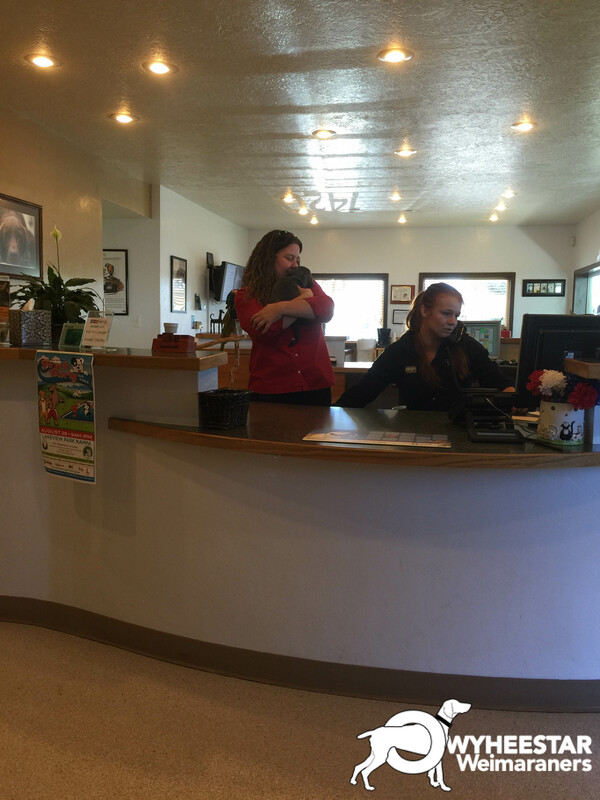 We just wanted to send you guys a quick update on Toby (Moxie/Benton) He just had his annual check up with Dr. Calhoun (at the Idaho Veterinary Hospital). Toby is one healthy pup! We saw your post on OwyheeStar Weimaraner Facebook Page the other day with Christmas Weimaraner photos, and wanted to shoot this one to you of Toby! Hope all is well, have a merry Christmas! Ryan and Brittany are friends of another OwyheeStar family. Referrals play a big in what we do. We get a lot of repeat families, and many new clients come to us after their friends share our information. Thank you for the referrals. We truly appreciate them!